New ACE Institute Co., Ltd.
New ACE started a new project of four years on April 2002. The project target is set for future regulatatioin, due to the strong and worldwide need for the reduction of exhaust emissions and CO2 in diesel engines. It was announced that the Japanese newest PPNLT regulation would be in operation in 2016, and the world harmonized and transient test cycle would be adopted. The advanced and extended combustion technologies, including the after-treatments and the low emission fuels, have been important to achieve the drastic reductions of NOx and PM. In Europe and the United States, diesel engines have been improving progressively by advanced technology, requiring low exhaust emissions, low fuel consumption and producing high output power. Taking into consideration the future requirements for these situations and the reduction of exhaust emissions, the project target is to make low exhaust emissions and smokeless, and the low CO2 exhaust level. Focusing on our high target for the reduction of exhaust emissions, we applied for the national Project of "The Development of the Super Clean Diesel Engine" and succeeded. Although this may be an enormous task, we regard it as very rewarding because we can contribute the result of our project to worldwide society. For the technology aiming at low exhaust emissions and large reductions of CO2, the turbo-charged system that takes in a larger amount of intake air into the cylinder than the current turbo-intercooler (TI) and a cooled EGR system will be adopted, and the common rail fuel injection system and combustion chamber suitable to new diesel combustion should be installed. Furthermore, the new diesel combustion must give satisfaction to be applicable to the advanced after-treatment. As the future diesel engine needs twice of the maximum cylinder pressure (Pmax) in order to increase the thermal efficiency, the strength of engine has been bearable up to twice Pmax of the current engines. Under the injector specifications of 0.17mm diameter and 6 hole nozzles and injection pressure 200-250MPa in our single cylinder engine (bore×stroke:135×140mm), the amount of air was increased up to 5 times of NA engine by increasing the boost pressure (Pb = 400 kPa gage). New ACE now introduces the experimental results that have been just obtained with our newly installed experiment system. The variation of the pressure diagram and the heat release rate are shown in Fig.1, when the boost pressure increased. The heat release rate with twice the amount of intake air of NA engine and under the boost pressure Pb = 100kPa shows rather slow combustion in comparison with high boost pressure conditions and it is expected that the combustion will change to high rate and this gives the high thermal efficiency under the condition of a larger amount of intake air such as high boost pressures, Pb=200-500kPa. The variations of Pmax and the brake thermal efficiency (η fb) when the indicated mean effective pressure, IMEP, was increased up to 3000 kPa, are shown in Fig. 2. In case of turbo-charging to the current heavy duty TI engine, of which the amount of air was twice of NA engine under the boost pressure Pb=100kPa, and it shows that the more the air increases, the more the brake thermal efficiency improves. In addition, an interesting result was obtained - the more the degree of super-charging increases, the more the peak of brake thermal efficiency moves to the high IMEP side. Before the experiment there was an anxiety, that is, the brake thermal efficiency with an increased Pmax would not improve because of the increased frictions by Pmax, but it proved not to be the case. 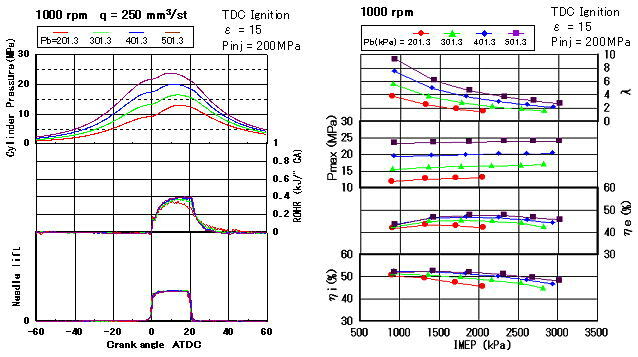 Fig 3 shows the combustion photograghs under the conditions in which the intake air was increased to approximately 3.5 times of NA engine, the air excess ratioλ= 3.5 constant, the nozzle specification remained the same and the injection pressure was 100MPa. Those photograghs show that when the boost pressure increased the combustion started at the same time as the fuel injection due to the ignition occurred soon and that the burning part and the unused air region separated distinctly. A moving image shows more clearly that under the high boosting, the burning part and unused air part separated and it is assumed that those parts cannot mix easily because of the large difference in their densities. Consequently, it is very important to invent the devices that can mix the burning and unused air parts easily under the high boosting. New ACE has introduced briefly the experimental results above mentioned and will make an effort to accomplish the new combustion task for clean diesel engine with fresh minds aiming to contribute to the society. Fig.1 Effect of boost pressures on cyl.